Throughout history, all major advancements have come about through the discovery of individuals who gathered together the information of their time and came to a particular conclusion which had previously gone unnoticed by others in the field. Such changes in the currents of thought are classically described by Thomas Kuhn in his classic work ‘The structure of scientific revolutions’ where he explains how the general public is often slow to come to full awareness about the most significant of historic discoveries. Dr David R. Hawkins book, ‘Power vs force’, may well serve as the modern day example of this revolutionary change which is only now gaining historical ground after over a decade on the local bookshelves. Described by Dr Wayne Dyer as “Possibly the most important and significant book I’ve read in the past ten years”, ‘Power vs force’ introduces a new scientific breakthrough concerning the use of muscle testing as a method for determining truth vs falsehood. Similar to a lie detector test in the body, Dr Hawkins gives a plain explanation for how muscle testing can be used to determine the truth about virtually anything and everything in the world. ‘Power vs force’ is the introductory work in a long line of follow up studies including ‘Truth vs falsehood: How to tell the difference’ and ‘Transcending the levels of consciousness: The stairway to enlightenment’. Historically speaking, Dr Hawkins, also explains how our modern age is at the tipping point of a major revolution in human thought. Many researchers have already spoken of this in reference to the discoveries of quantum theory and non-linear dynamics but Hawkins makes these discoveries even more plain in terms of their context for this modern day revolution. Until now, science and spirituality have only been flirting with each other but a consummation of their relationship is now pointed at directly through the use of the muscle testing method. Many intellectuals like Fritjof Capra, Neale Donald Walsh and Deepak Chopra have all suggested such a revolution in our time but no single researcher stands out as a landmark figure like Dr David R. Hawkins. He may indeed be pointing the new direction that humanity is soon to take in this revolutionary move. Starting his career as a psychiatrist in New York City, Hawkins was the head of the largest practice in the country. He eventually abandoned his work to pursue a more solitary mode of research in both spirituality and muscle testing research. ‘Power vs force’ now proposes a monumental discovery concerning the ability to determine the truth about various statements and ideas through the use of the Chinese acupuncture system. This application may well be used as a means of reaching far beyond the scope of the simple lie detector test and portends to be applicable anywhere and at any time. This is truly a landmark achievement for humanity and a must-read for anyone interested in the subject. 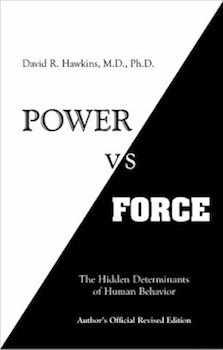 Power vs force: The hidden determinants of human behaviour by David R. Hawkins M.D. Ph.D.